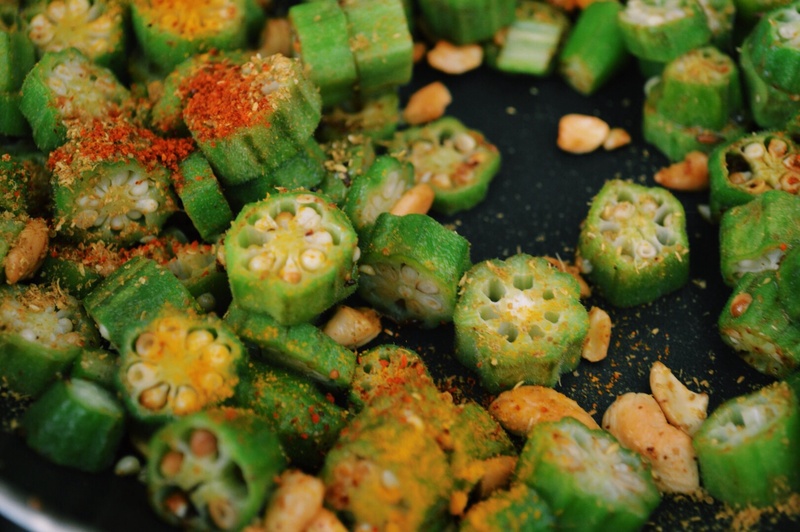 Okra, a.k.a lady finger/gumbo is high in Vit. C & K, folate, and fiber. 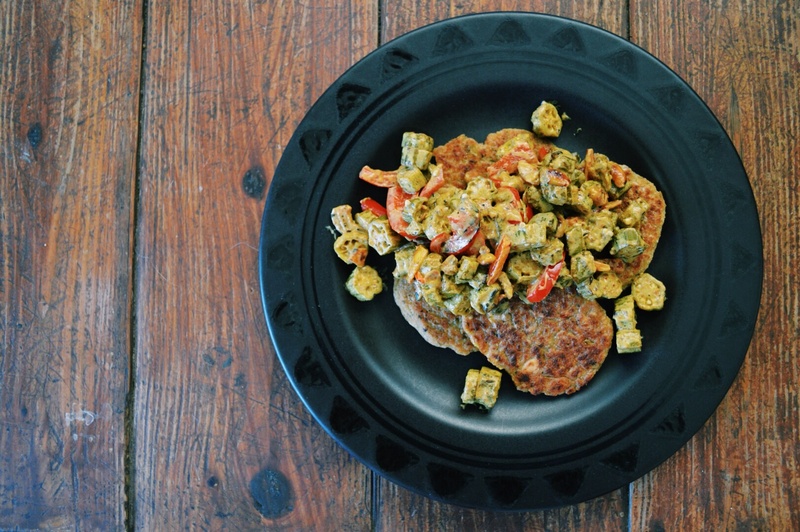 The high dietary fiber content of okra supports colon health as a natural digestion aid. 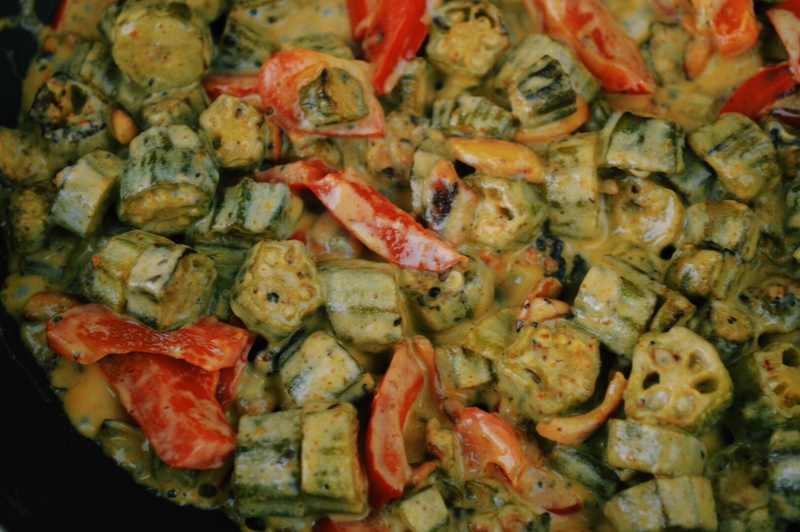 Okra also helps stabilize blood sugar, great for diabetes monitoring & prevention. 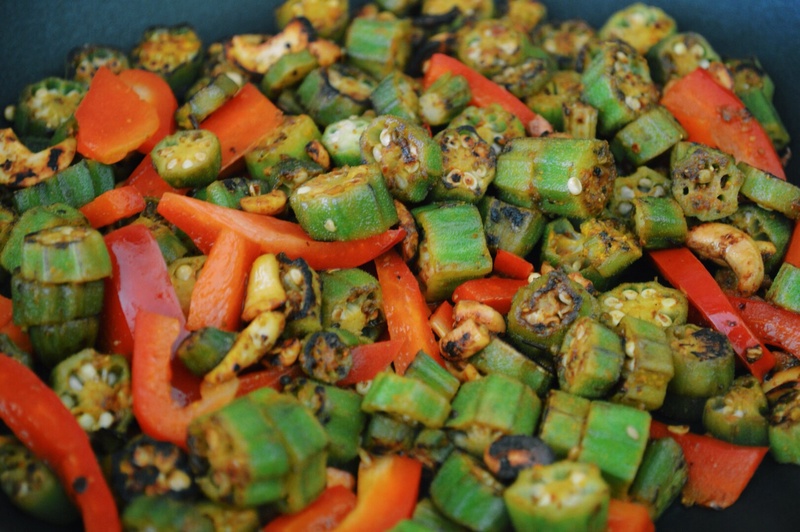 High in folate, okra also can promote healthy pregnancy. Vitamin C rich food has been shown to help relieve respiratory issues like asthma and promote healthy skin. Heat coconut oil in a large frying pan. Add mustard seeds, bay leaves, cumin seeds, cashew pieces, and cloves to hot oil and let sizzle for a few minutes. Add chopped okra and toss. Cook for 5 minutes on medium heat and then add salt and remaining spices. Squeeze fresh lemon juice and cook on high for 5-7 more minutes. 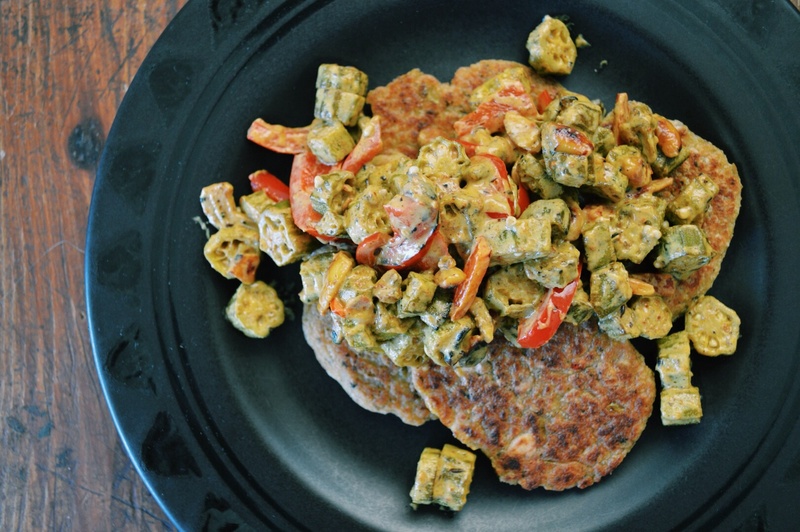 Toss in red bell pepper, and give the pan a flick to mix; cook until red pepper and okra are tender. 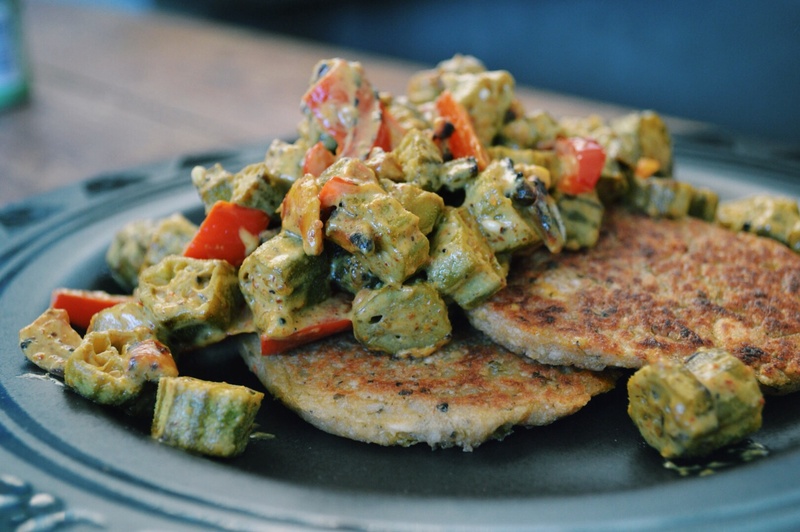 Pour coconut milk over cooked veggies, and mix in evenly. If too thick, add a splash of water. 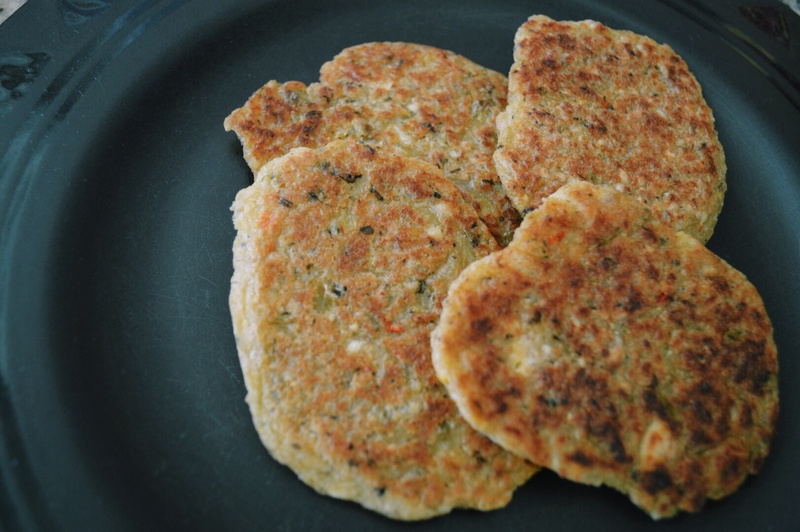 Serve over warm plantain cutlets. See the patty recipe here. Roommate perk: just got to eat some of this, and it’s AMAZINGGGGGGG!!!!!! I’m going to steal all the leftovers.